Daniel McCoy Wyckoff, Major (USAF, Ret.) passed away peacefully in the early evening of December 11, 2018 at the Idaho State Veterans Home. Dan was born on March 13, 1925 in Claremore, Oklahoma, one of eight children born to Henry Andrew Wyckoff and Sarah Rebecca Hause Wyckoff. He was a member of the Cherokee Nation, attended Justus-Tiawah Elementary School, and graduated from Sequoyah High School in 1943, where has was a member of the National Honor Society and played basketball. Upon graduation from high school, at the age of 18, he joined the United States Army Air Corps, and within six months was a C-47 transport aircraft commander. He participated in the invasion of Holland in September of 1944 and provided numerous relief missions for the Allies, as well as to refugees during his time in Europe. 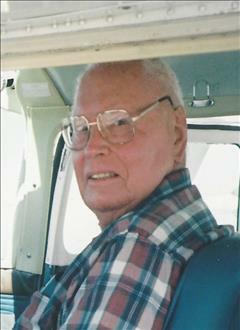 He returned to the US after the war and graduated from the Spartan School of Aeronautics in Tulsa, Oklahoma in 1948. During his lifetime he logged at least 19,200 hours in the air and flew more than 75 makes and models of military transports, fighters, and bombers; as well as numerous types of civilian aircraft, including gliders. Dan was a veteran of three wars – World War II, Korea, and Vietnam. Dad grew up on a farm outside of Claremore, Oklahoma the youngest of five surviving brothers. The family had to make due during the difficult times of the Depression, but Dan’s childhood was also full of fun and adventure – as Oklahoma was still growing and transforming after reaching statehood. The brothers were fiercely competitive and protective of each other and these bonds built strong ties that survived throughout their lives, with all of them serving in the military during World War II. Dan had an aptitude for mechanics and could fix almost anything and he was an accomplished woodworker. He was also an avid reader of history and a photographer. When the children were young, and Dan was on leave, the family took many vacations around the country in their small trailer. He greatly enjoyed gardening and raising fruit trees while living in Florida, as well as, hunting and fishing during his many travels around the globe. He was also a Scoutmaster to the Boy Scout troop Don belonged to while stationed in Michigan. He met and began dating Betty Jean Stumpf in late 1945, while stationed in Ft. Wayne, Indiana and on March 29, 1947, they were married in the Methodist Church in Claremore, Oklahoma. Dad and Mom started married life together in Wichita, Kansas since Dad had joined the Kansas Air National Guard and was teaching flight lessons there to anyone interested. They would celebrate 71 years together. In mid-1951, the Kansas Air National Guard was recalled to active duty and in late 1951 Dan left for Japan and Korea. In February 1952, their first child, Donald A. Wyckoff was born in Ft. Wayne, Indiana but it would be almost a year before Dad would return home and get to hold him. Their daughter, Beverly A. Wyckoff was born in Chandler, Arizona in May of 1956, but before the year was out, Dad would again be posted overseas while the family remained in Arizona. Over the course of a nearly thirty-year career in the Air Force, Dad would be transferred numerous times, and our family lived in 30 different homes – as well as extended periods in hotels, apartments, and trailer courts. His many postings while in the United States Air Force involved service with the Tactical Air Command and the Strategic Air Command, and he flew combat missions in Korea and Vietnam for each, respectively. Returning from Korea, Dan was first posted to Texas where he instructed pilots from 15 NATO countries in fighter gunnery as the European countries continued their rebuilding process. He would later travel to Saudi Arabia to help start the fighter tactics and gunnery school that trained the top pilots from Middle Eastern countries, Pakistan, and Iran in their first jets. His transition to bombers occurred during the late 1950’s with the continuation of the Cold War. Dan would fly B-47s and B-52s during this time and stood air and ground alerts during many periods of political uncertainty. During his first tour in Vietnam he flew special, in-country missions but his second tour involved flights over North Vietnam. Dad earned numerous commendations, awards, and decorations, during his military career, including the Bronze Star and the Distinguished Flying Cross. Dad retired from the Air Force in November 1971 and the family relocated to Altamonte Springs, Florida. He soon gained employment as an executive pilot and would fly for a number of companies including Unit Electric Control and Anheuser Busch. The last 13 years of his flying days in Florida were also spent in a flying club as an instructor and maintenance supervisor. In 2006, Dan and Betty moved to Chubbuck, Idaho to be closer to their son, Don, and their daughter-in-law, Candie. Although he would continue to fly after moving west, his last flight occurred on July 12, 2015, the 72nd anniversary of his first solo. In 2011, Dad received the prestigious Wright Brothers Master Pilot Award from the Federal Aviation Administration. The award honors pilots with 50 or more years of flying experience, with no accidents or violations. Dan belonged to the Masonic lodges in Wichita, Kansas, Orlando, Florida, and Pocatello. He was also a member of the Quiet Birdmen in Wichita, Orlando, and Twin Falls, Idaho; a Shriner; and a member of the American Legion. He was an active member of the Wekiva Presbyterian Church in Longwood, Florida, and the First Presbyterian Church in Pocatello. Dad worked on many relief projects for the needy and less fortunate while living in Altamonte Springs and his participation in the Shriners provided many opportunities to fly children with special medical needs to Shriner hospitals around the country. Around Pocatello he helped with Habitat for Humanity and with the First Presbyterian Church until his health declined. Dan is survived by his wife, Betty Wyckoff, his son, Donald Wyckoff (Candie) and his daughter, Beverly Wyckoff (Charles Ginsburg), many cousins, nieces and nephews. He was preceded in death by his parents Henry and Sarah, and by his eight siblings, Rue Kelsey, Harry Wyckoff, Jean Rumbaugh, Paul Wyckoff, Jack Wyckoff, McMein Wyckoff, Joseph Wyckoff, and Benjamin Wyckoff. A viewing will be held between 6:00 and 8:00 pm on Monday, December 17, 2018 at Cornelison Funeral Home, 431 N. 15th Ave. in Pocatello. Funeral services will be held at 11:00 am on Tuesday, December 18, 2018 at the First Presbyterian Church, 202 S. 7th Ave. with a visitation one hour prior to the service and a luncheon after the service. Interment will follow later in the day at Mountain View Cemetery. Memories and condolences may be sent to the family at www.cornelisonfh.com . In lieu of flowers, please consider donations to the Presbyterian Church God’s Fund, which assists those less fortunate in Pocatello, or to the Idaho State Veteran’s Home of Pocatello. The family would like to offer a special note of thanks to the entire staff at Idaho State Veteran’s Home of Pocatello for all the kind and considerate care that was provided to our father during these last five months.